The Healthy Eating & Sugar Sweetened Beverages manual is an at-your-fingertips resource for early childhood practitioners. Use the games, guidelines, recipes, tips and tools in this manual to facilitate an active, healthy environment in your childcare centre. Guidelines – these general guidelines, or your provincial or territorial regulations, should be used in your childcare centre. The Healthy Beginnings Guidelines can be seen as “gold standards” that will help you to create a positive environment for healthy eating, physical activity, screen time and reduced sugar sweetened beverages. Practices – this section will help you use the guidelines in your centre. It includes tips, resources, games, activities, recipes and more that you can use for planning each day. Environment – this section provides some tips on changes that you can make to the physical environment at your centre. Ideas include books and songs, setting up a designated eating space, and other ideas that will promote physical activity and eating. Family – these resources will help you support the families of the children in your centre. Here you will find sample newsletters, games, tips and resources to provide to parents. Please visit the the Healthy Eating & Sugar Sweetened Beverages webpage to download specific sections from the manual. Or see the Physical Activity & Screen Time webpage to download sections of this manual. For resources and information from your province or territory, you can visit any of the jurisdictional webpages for additional information and resources. 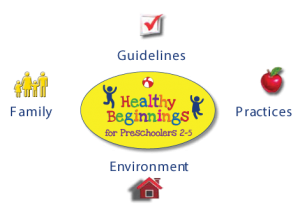 Information, documents and photos on this website were produced and/or compiled by the Healthy Beginnings 2-5 project team for the express use of early learning practitioners and families. Please contact us if you plan to use these materials for any purpose other than your own personal use.